After realizing that relying on only five diamond suppliers made it very difficult to remain competitive, Diamond Brokers Queensland knew that they needed access to a wider network of suppliers. Now that they have seamlessly integrated RapNet Instant Inventory into their website, they have access to millions of diamonds worldwide and can instantly find exactly what their customers are looking for when they show up with a specific diamond in mind. 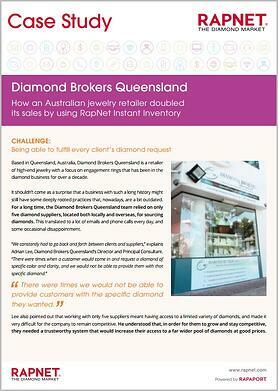 Find out how Diamond Brokers Queensland’s sales have increased dramatically since implementing RapNet Instant Inventory. Download the Case Study now to read more.